FamilyTimePlanner is now on Facebook as Family Calendar. An Online Calendar for the Whole Family! 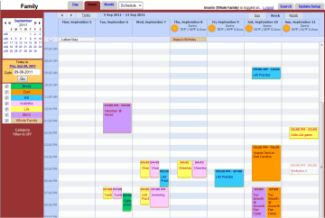 Organize your family calendar online and in color. Share your event information with friends and family. Control the visibility of individual Family Members activities while sharing others' schedules. Create Unlimited UserIDs for Family Members, relatives and friends. Limit which Family Members can be viewed by UserID. Print your color coordinated calendar in color. Connect online calendars together - great for teams, schools, scouts, etc. Send email reminders to your email accounts or cell phone/pager. Publish information about practices, games and meetings for your Teams or Clubs. Add a fully customizable calendar to your website. Import and export your calendar to and from Microsoft Outlook. The FamilyTimePlanner online calendar simply helps families manage their time together. Create as many Club Calendars as you would like as long as you have a current Family Calendar! Check out our Community Giving Program for your church, school or club. Our online calendar affiliate program is great way to publish group information and raise funds.